We have good fertility recommendations for various areas in the East on the resources tab. 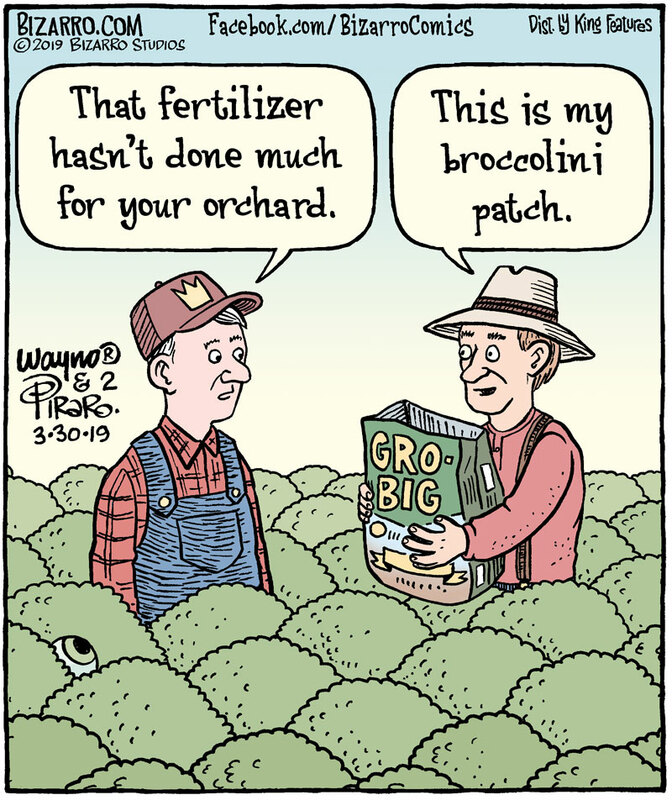 A recent Bizarro comic has a great reference to broccoli’s ability to use fertilizer. (c) Dan Piraro Used by permission. 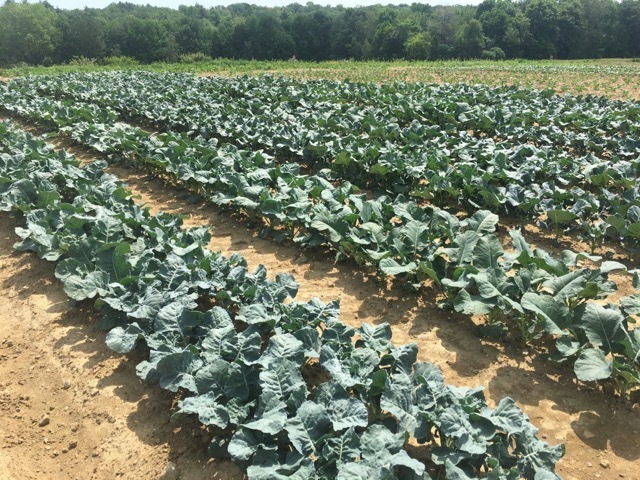 We are not in cahoots with the “National Board of Broccoli Producers,” so broccolini is a fair stand-in at the Eastern Broccoli Project. Broccoli on muck soil gets a lot of nitrogen and water, and can grow very tall. 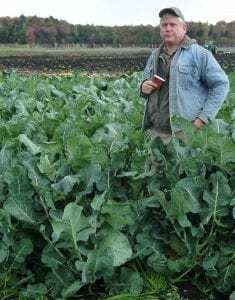 Retired Cornell broccoli researcher Joe Shail provides the scale. One consideration is that broccoli can get too big, and get hollow stem. Growers harvesting in the heat of summer find that making the last nitrogen fertilization four weeks before harvest helps avoid the excessive burst. Some early varieties are maturing in 50 days in the summer. If you do the math, that means the last nitrogen side dress or fertigation is just three weeks after transplanting. Putting on ~150 lb/ac of nitrogen without burning the plants takes some planning. Alternaria was widespread in the East this year. Unrelenting rain after mid-August created conditions in the Northeast that were conducive to this normally secondary disease. More important, the strain going around was not controlled by the most commonly used fungicide. Alternaria lesions on head are deep. Even one renders the head unmarketable. This year, Tim Coolong reported in August that a Quadris-resistant strain was showing up in Georgia. Christy’s trial showed Quadris failing to control in New York. The good news is that the Alternaria was susceptible to fluxapyroxad and pyraclostrobin, the active ingredients in Priaxor. Priaxor is already labeled for use in New York, except Long Island. The hot and humid weather with heavy rainfall from remnants of hurricanes during August was the perfect storm for Alternaria leaf spot (ALS) to rage out of control in brassica crops across Western New York in 2018. Cornell Vegetable Program fresh market specialists received several complaints about a disease that caused unsightly lesions on both leaves and marketable portions of brassica plants. When ALS attacks the head of broccoli or cauliflower, it renders them unmarketable. 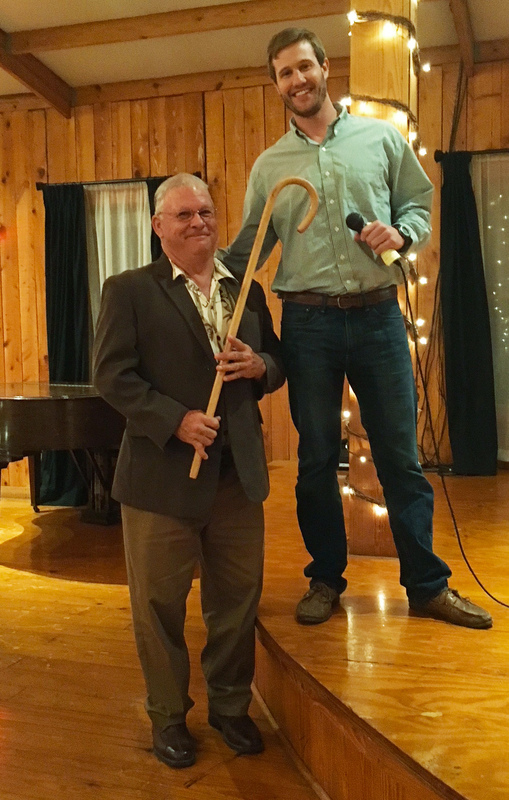 Hoepting visited with a grower who was planning to cut broccoli production by one-third, because he had just lost over 85% of his most-recent 5-acre planting to ALS head rot, a loss of $7,500. She immediately set up an ad hoc small-plot replicated trial on his farm in hopes of finding a fungicide that could control this devastating disease. 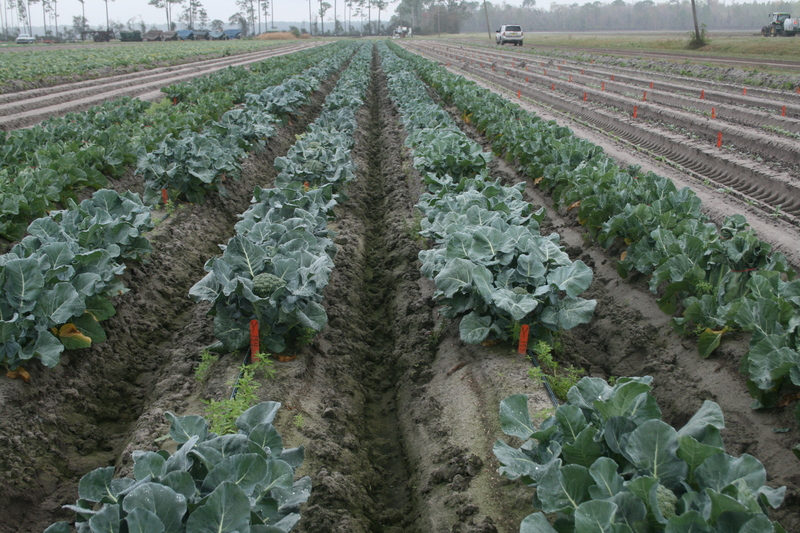 By the time the broccoli was ready to harvest, differences among treatments in side-by-side plots were striking. In the untreated check, 98% of the heads were unmarketable due to severe ALS, while the best fungicide in the trial, Merivon (fluxapyroxad and pyraclostrobin) had only 5% un marketable heads. The fungicides that the grower had been using, Bravo and Quadris (azoxystrobin), resulted in 98% and 49% unmarketable heads, respectively. Commercially available fungicides Switch, Quadris Top and Endura had significantly lower unmarketable heads than Quadris with only 10 to 33%. Priaxor can be applied at most 2 times sequentially and 3 times total. The only targeted fungicide that can be used with it in a program is Switch (cyprodinil and fludioxonil) because its active ingredients are in different chemical groups (FRAC groups 9 and 12) from those of Priaxor (7 and 11). If the grower were to adopt a 4-week fungicide program with top-performing fungicides, he could expect to get at least 75% marketable heads. Compared to his Bravo/Quadris program, which only yielded 1470 pounds and net $1,323 per acre, the new program could increase both yield and net profit 5-fold by 5881 pounds and $5,562 per acre, despite a 5-fold increase in cost of fungicides from $44 to $223 per acre. 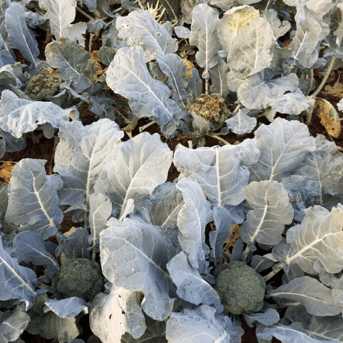 After viewing the fungicide trial on his farm, the grower immediately adjusted his fungicide program to include the most effective fungicides in all of his remaining brassica plantings. 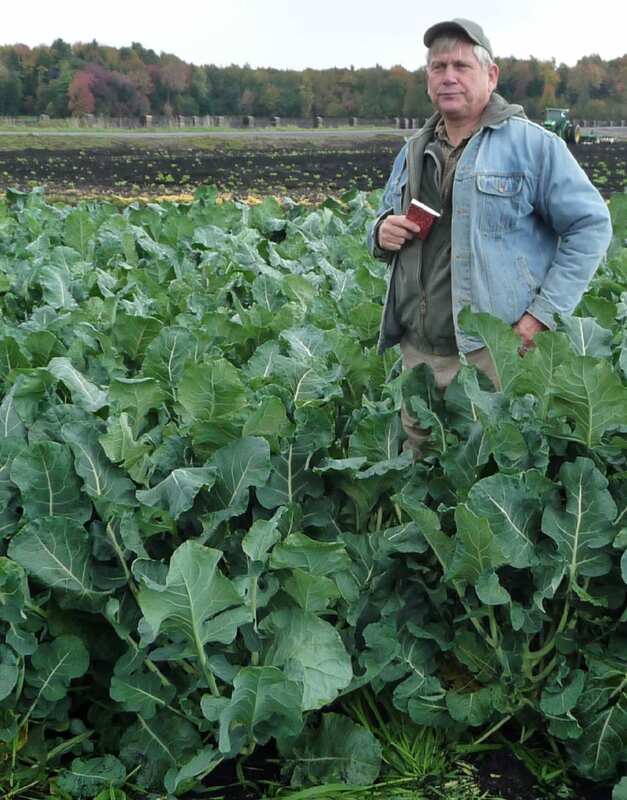 He is planning to resume full broccoli production next year with the new fungicide program, which has potential to increase profit by $166,860 in his 30 acres of broccoli. 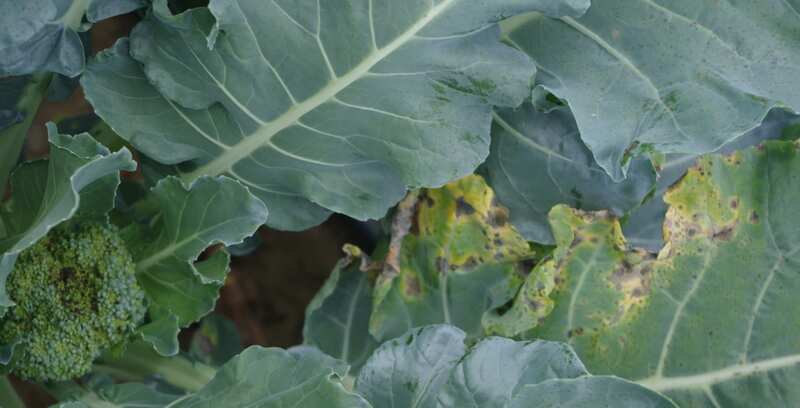 Trial results will be shared with CVP growers over the winter, so all conventional growers can benefit from improved ALS control in their brassicas. 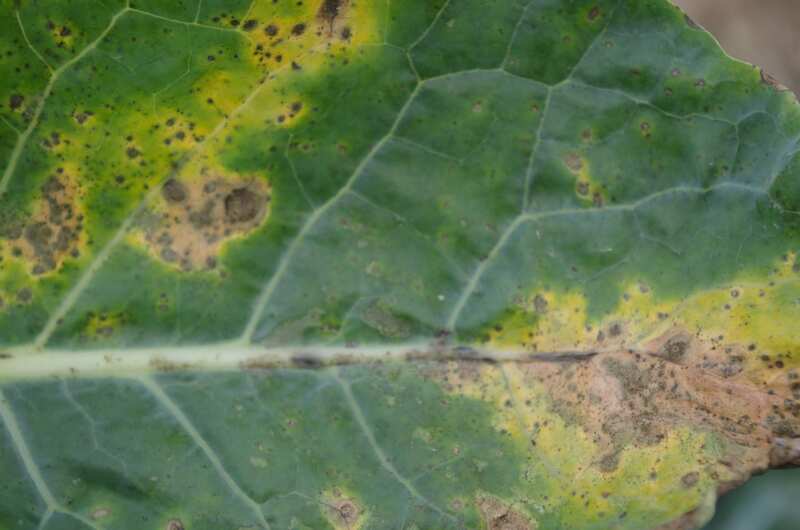 The Alternaria pattern can give false hope. There are lesions on older leaf, then clean younger leaves that grew after the big rain. However, the infection also affects the head. Note added January 11: Today at the Southeast Vegetable Conference, Dr. Bhabesh Dutta of the University of Georgia at Tifton showed that the pathogen present in Georgia this year is a different (new) species of fungus that it is not controlled by azoxystrobin. Pathologists around the East are testing isolates from their regions to determine whether this species is the one that cause unusually high losses in the region. This result is useful in that Dr. Dutta has already identified a fungicide program that should be effective in 2019. If the other azoxystrobin-resistant isolates turn out to be the new species, it mean that there has not been a change in the usual Alternaria. 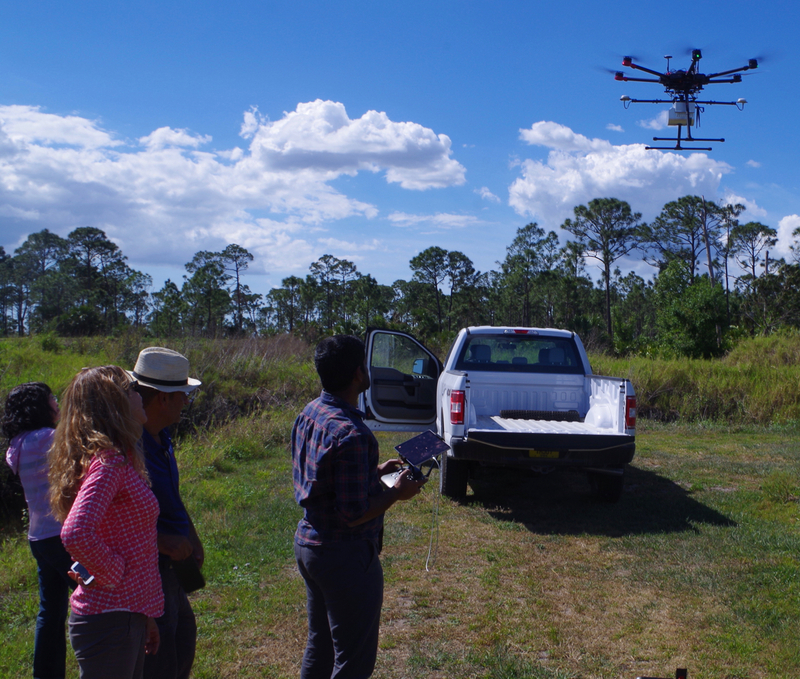 At the end of February, Project Director Thomas Björkman had a chance to visit Monica Ozores-Hampton’s trial site at the University of Florida’s Southwest Florida Research and Education Center and farmers in nearby Immokalee and Clewiston (between Lake Okeechobee and the Everglades). The SWFREC has seven new faculty, which really adds energy. Like elsewhere in Florida, managing citrus greening is a big priority. Monica Ozores-Hampton and her SWREC colleagues using infrared imaging to track crop growth by recording individual plants through the season. The research station has recovered from Hurricane Maria last fall, with some new greenhouse facilities replacing ones lost. 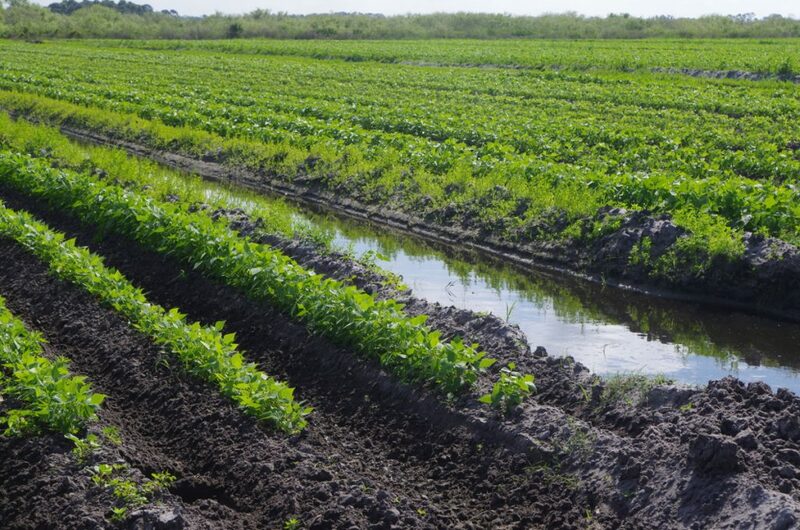 The fields at the station are set up to use the distinctive seepage irrigation system common in parts of Florida that have sandy soils with a hardpan. The crop in the Yield Trial is growing well and should produce good results for spring. The February days were 85°, so warmer spring weather will definitely test the adaptation of these hybrids. 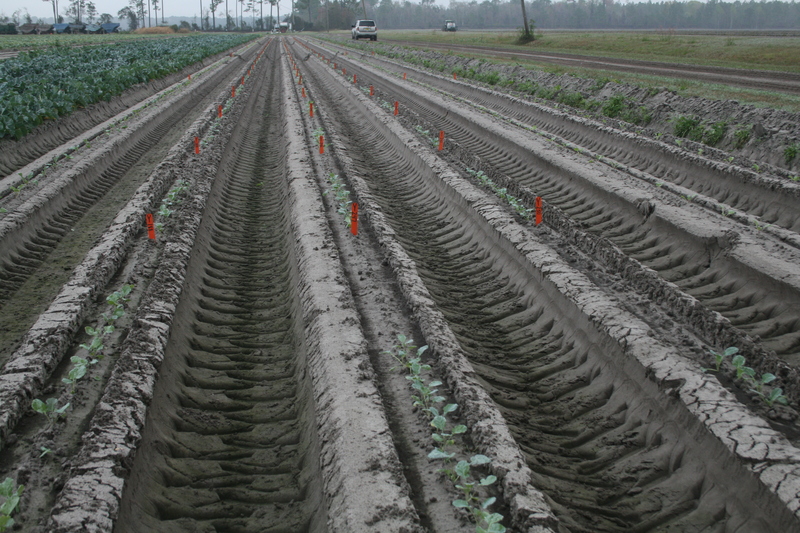 Monica Ozores-Hampton’s yield trial at the UF Southwest Florida Research and Extension Center in Immokalee, Florida. 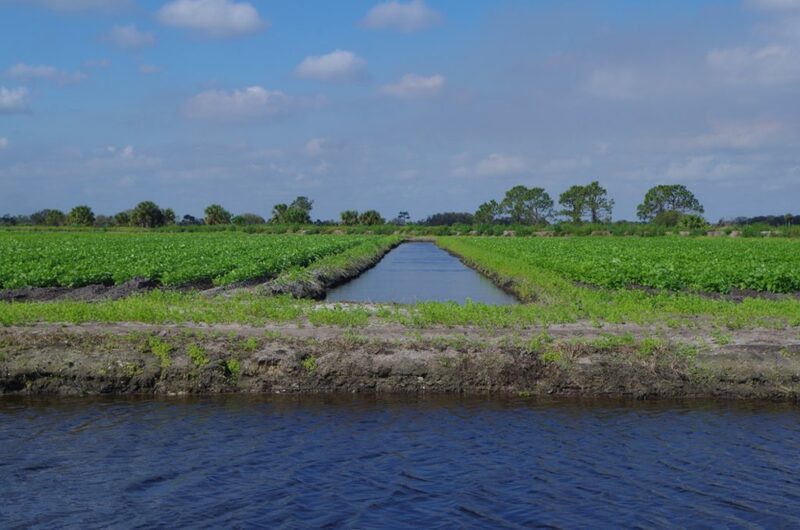 The trial is on a sandy soil using a seepage irrigation system. This February day began at a balmy 70°F, which suited the students on spring break in nearby Ft. Myers just fine. 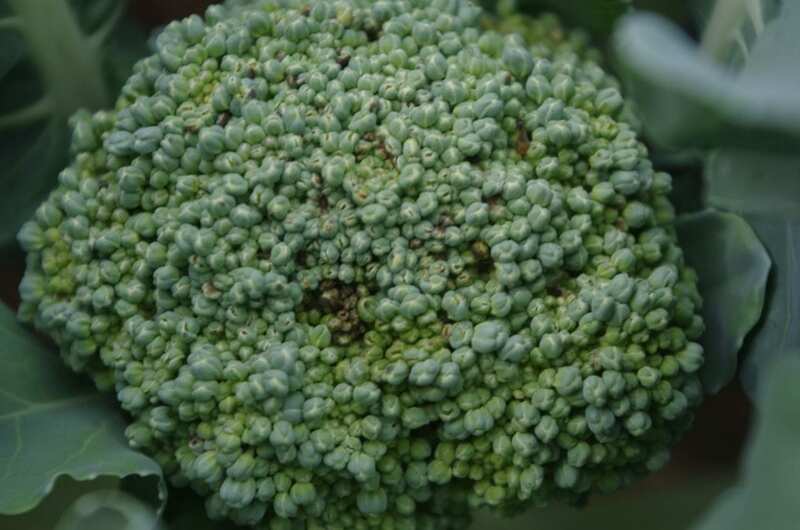 But that night temperature is too high for broccoli reaching the most sensitive stage of development (and for winter-hardened Thomas Björkman, pictured). The grassy field edge runs along an irrigation ditch. In the morning, alligators like to come out of the ditch to sun themselves on the grass. 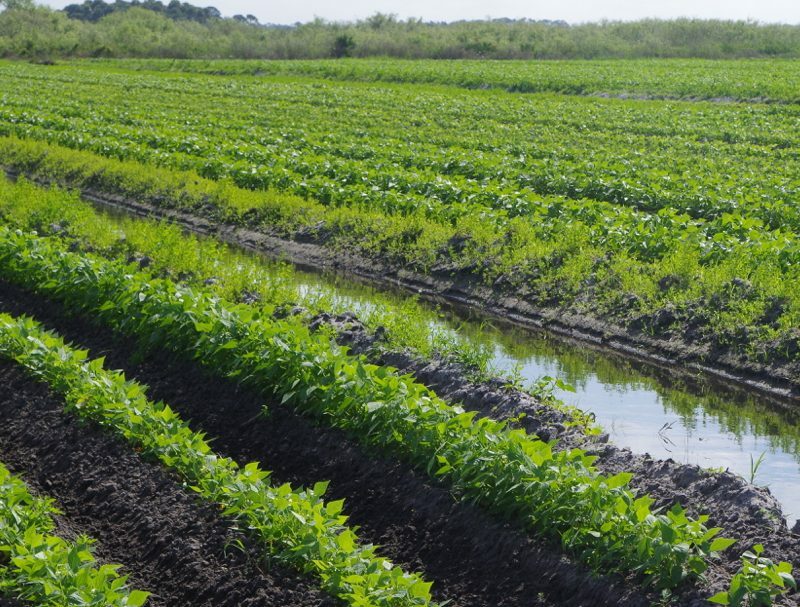 Vegetable farms in SW Florida are generally larger than elsewhere in the East. The smallest farm we visited raises a thousand acres of green beans and sweet corn. The land costs are moderate, and the sandy soil can be managed with appropriately scaled equipment. At this scale, vegetables reach large-scale buyers through the most prominent of eastern produce distributors. The farms we visited all know very well how to raise broccoli efficiently. The bed system means that the plant populations are lower per gross acre than solid stands. Nevertheless, the yields have been good, pests are uncommon, and the labor has been available for harvest. The main limitation has been access to markets. 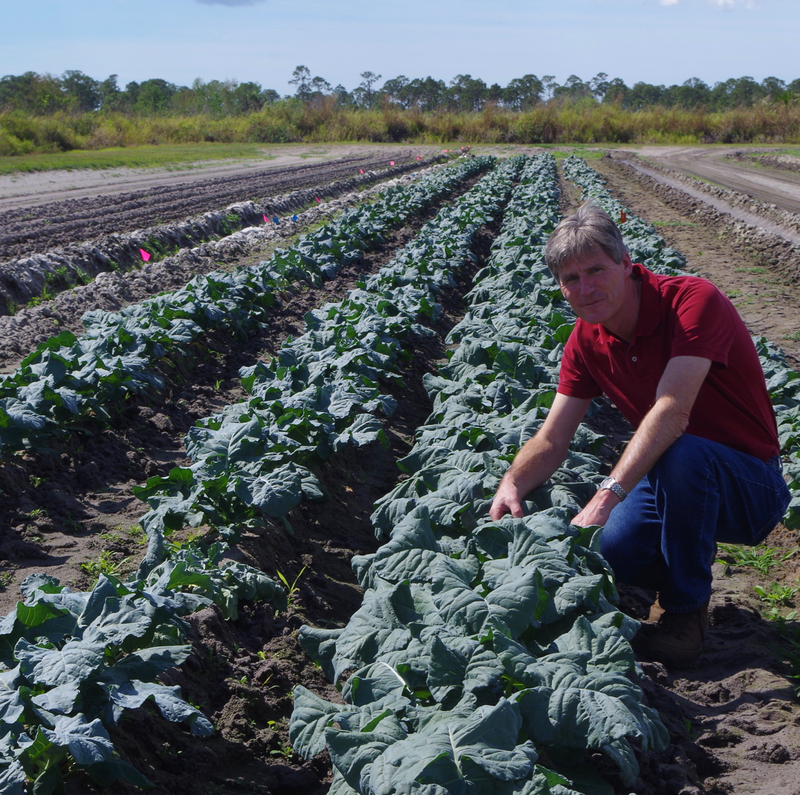 The growers noted some irony in being unable to interest south Florida buyers in local broccoli, but finding buyers in New York appreciated getting winter broccoli from closer by. A good relationship between buyers and sellers appears to allow many efficiencies that improve product quality and reduce costs.